The Castlemaine Town Hall Honour Roll commemorates those from the district who served in World War One. The roll was officially unveiled in 1918. The tablet placed in the entrance to the Castlemaine Town Hall, which was presented to the borough by Cr. Corbel, is just about completed, and the names of the borough soldiers will shortly be inscribed on it. The tablet is an attractive one. On a silver shield are the words. "The Great War, 1914 :—" the blank being for the year peace is declared. Over the list of names the inscription will be: "Citizens of Castlemaine and Soldiers of Empire." Considerable difficulty has been experienced in collecting the names of all borough soldiers; but up to the present 280 names, arranged in alphabetical order, are ready to go on the roll. The public are asked to scan the list and to send in additional names if any are omitted. Kyneton Guardian (Vic), 15 August 1916. The honor board presented to the borough by Cr. Corbel and placed in the entrance to the Town Hall, has now been completed, the work of inscribing the names having just been concluded by Mr J. A. lredale. It would be advisable for all interested to inspect the board, as it may be that wrong initials have been used in some cases, and in others the name may be wrongly spelt, while it is possible some names have been omitted altogether. All interested should inspect the board without delay, and if any error has occurred it should be reported to the committee, which consists of the Mayor (Cr. Cornish), Crs. Freeman and Corbel. Mount Alexander Mail (Vic), 2 September 1916. The Castlemaine Honour Roll was officially unveiled by the Governor-General, His Excellency Sir Ronald Munro Ferguson, on the 11th April 1918. 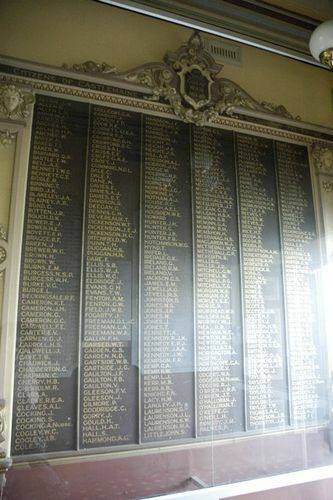 The honour roll in the foyer of the Town Hall contained 400 names with additional names to be added. The town was bedecked with flags, streamers and banners on the occasion of the first visit of the Governor-General to the town. Bendigonian (Bendigo), 18th April 1918.